A holiday dessert work crew made up of cousins, aunts and uncles usually assembled the weekend before Thanksgiving at my grandmother Mimi’s house. Mimi always prepared both Thanksgiving and Christmas desserts the week before Thanksgiving, and the lengthy menu required many helpers. Most menu items not to be served at Thanksgiving would be wrapped, labeled, and deposited in the freezer or pie safe, delicious desserts like presents waiting to be opened. My grandfather Da was an essential helper in the preparation of one ingredient. He brought a large, for-real coconut into the middle of the living room and presented it for inspection to us kids. We passed it around, each one hefting and guessing how heavy it was. Placing it on the floor in the middle of a spread newspaper, “Stay back,” he warned before whacking the coconut with a hammer. Often it took several smaller whacks before he could pry the outer shell away. His pocket knife then became a chisel as Da drilled a hole into one end, then drained the coconut milk into one of Mimi’s measuring cups. Soon he was sawing off little chunks of fresh coconut for us to snack on before we started on other pre-baking assignments. The rest would be grated for at least two large pies and one multi-layer cake. A navy blue and white roasting pan sat on the floor in the living room, overflowing with pecans picked up in a neighbor’s orchard. A smaller pan full of store-bought walnuts sat nearby, and in between us volunteer laborers, paper sacks waited for the empty shells. Hinged metal nutcrackers and clean mixing bowls were distributed to the crew and a-cracking we went. Of course, you can’t crack pecans and walnuts and not sample the goods. You have to be sure the nuts are fresh and tasty, don’t you? But there were always extras, and Mimi didn’t care if we snacked a little on pecans — our appetites were soon satisfied and set into competing to see who had the most “whole” pecan halves. The pecans that weren’t would get chopped up for the fruit cake, of course, but we needed a lot of “whole” halves for pecan pies. Once the nuts were finished, it was time for egg gathering. Mimi’s chicken yard was a large wire-fenced oblong with the chicken house at the very back of that space. In between the front gate and the chicken house were several dozen red and white hens and one ornery rooster. Sometimes that rooster took a cockeyed look at me and just knew I was his mortal enemy. Those days I did not enjoy getting selected to collect the eggs. I had to go armed with a broom or a tobacco stick to fend off beak and claw while I made my way through hens who clucked around my feet, thinking I was bringing them some fresh chicken feed. Keeping an eye out for the rooster, I’d edge my way into the chicken house, perhaps shoo away a hen or two, then carefully place the eggs into a small basket. The reverse course wasn’t much more fun either and all the time I was having to watch where I stepped — you know how neat chickens are, I’m sure. While Mimi created the batter for the fruit cake, I helped mix the fruit and nuts. Red and green candied cherries, watermelon rind, currants, chopped pecans and walnuts went into a clean foot-tub, stirred with a heavy metal spoon. I’m sure I’m forgetting some ingredients, but I’ll never forget how tired my arm got in the mixing process. Mimi used a pound cake recipe for the base cake, real butter and sugar. Lots of eggs. Almond, lemon and vanilla flavorings went into the batter. Then it was time to add a whole jar of Damson plum jam for color, extra moisture and flavor. Combining the cake batter and the fruit mix was no easy task, considering how much of each one there was. It took two five-pound tube pans and one two-pound loaf pan to contain the batter, and then several hours to bake. Once the fruit cakes were done and cooled, Mimi wrapped one up in tin foil and set it on the sideboard. That one we’d eat at Thanksgiving. The other she wrapped in wine-soaked cheesecloth and stored in her pie safe, to be “basted” in wine another time or two before Christmas. By Thanksgiving day the dessert menu was complete: Pecan pies, pumpkin pies, and coconut pies. Pineapple torte. Coconut layer cake, fruit cake and pound cake. When my children were small, for several years I tried to duplicate Mimi’s efforts. I baked two of each kind of pie and cake, one fresh for Thanksgiving, one stored away for Christmas. It was much simpler, since I didn’t have to crack a coconut, pecan or walnut, and didn’t have to maneuver through a messy chicken yard avoiding clucking hens and ornery rooster. Making fruit cakes was a wonderful time of chopping nuts and remembering Da, chopping fruit and remembering Mimi. I might just do it again one of these years. Black-haired and hazel-eyed, my Irish mother was the only girl in a family with four brothers. 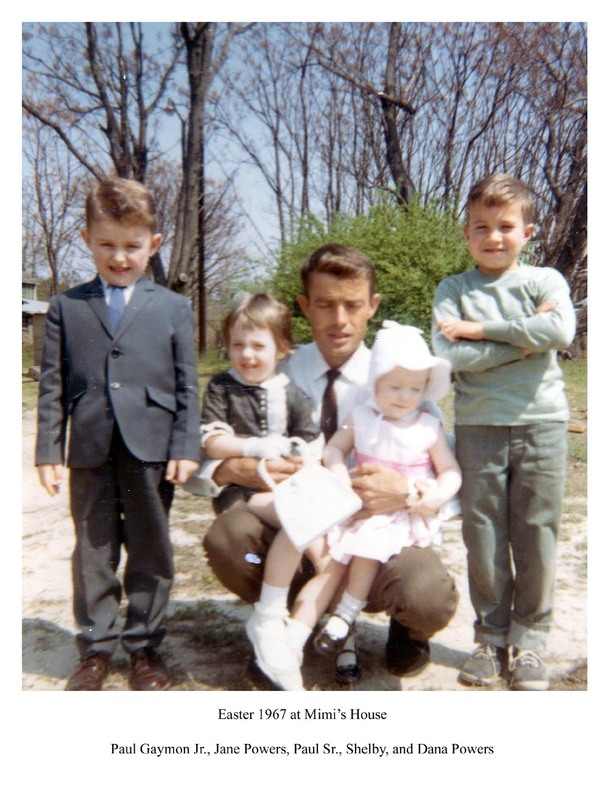 All her brothers’ hair began to turn gray at an early age, but mama’s didn’t. She just had a narrow streak of white from her right temple straight back through her lush, black waves. Unfortunately, my hair took after my English daddy, who had brown hair and blue eyes. I was always jealous of mother’s hair. When I was fifteen years old or so, mama took me to her hairdresser. 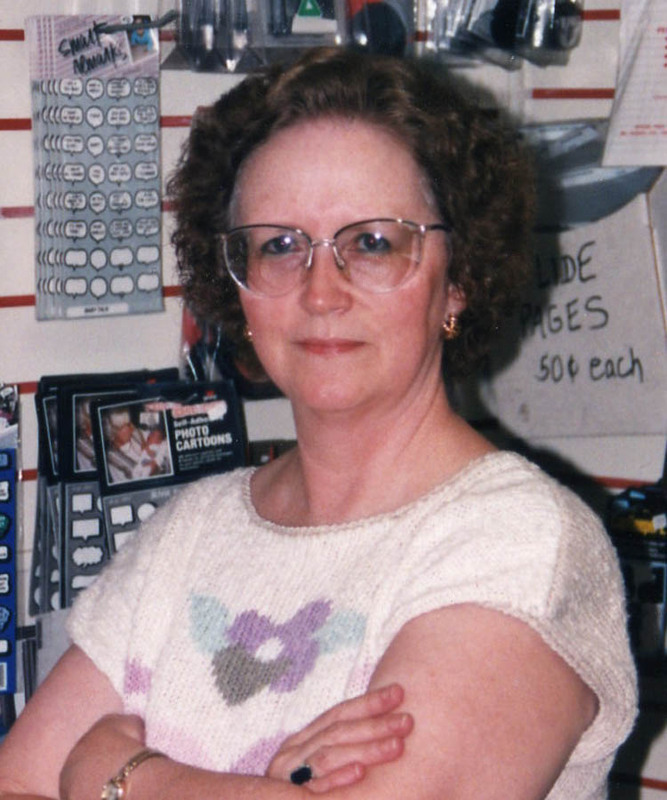 The shop was centrally located in a storefront beside Sears, Roebuck and Company on North Irby Street. I thought I was getting a hair permanent, an event I dreaded. Frizzy, smelly, itchy curls for Easter. More frizzy, smelly, itchy curls for Christmas. I pouted as I was draped in plastic and the leather chair pumped up to the appropriate level. My mood didn’t improve as mama whispered something to the beautician, gave me a pat and said she’d be in the cubicle next door. The next thing I knew the circumference of my face and neck was being wrapped in cotton batting, as usual. Cold smelly chemicals were dabbed on my hair, just like usual. My head was encased in a plastic shower-cap, an egg timer was set and a magazine plopped into my hands. Determined to make the best of it, I got engrossed in the romantic short story in the Redbook and tried to ignore the drips escaping down the back of my neck. “We’ll do the roll-ups in a bit,” the smiling lady said as she went out for a chat with mama. Eventually the timer went off, the breezy beautician returned, peeked under the plastic, pronounced it “just right” and whirled me around to the sink for a rinse. Huddled under the noisy hair dryer, I finished Redbook, McCall’s magazine and an old Readers Digest before we got to the un-roll and the brush-out. Finally the smiling beautician presented me with a hand mirror. Holy cow! My hair had undergone a miracle! It was no longer a mousy ash brown – it was now a lovely auburn brown. (I have never seen my natural hair color since.) 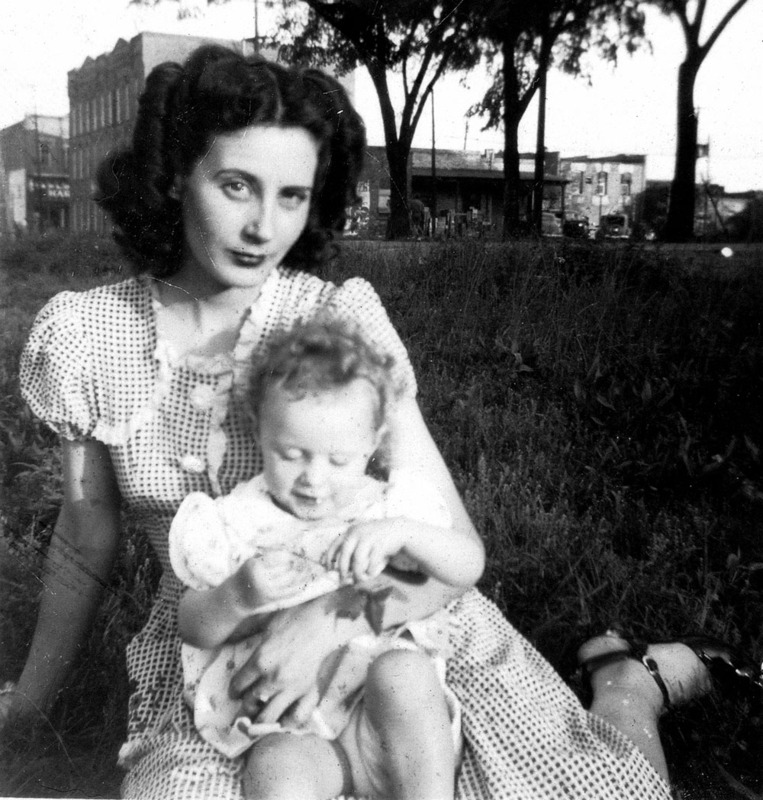 I suddenly loved my mother fiercely – she understood, she really understood how much I had always admired her hair, how much I had always deplored mine. Soon after that my whole family, grandparents and all, went to a movie at the Carolina Theater. It was rare for the grandparents to attend a movie – raising their family in the depression years they didn’t “hold with frivolous foofaraw.” But there they were standing in line just behind mama, daddy, Harold and me. In a gruff whisper, Da spoke into Mimi’s ear. “Betty’s sure gotten to be red-headed, ain’t she…” You could hear the question mark in his comment, wondering how on earth my hair had gone from brown to red. Da’s brand of Irish were Black Irish – mostly black or dark-haired, not red-haired, and they didn’t change their gene structure at fifteen. I can still hear Mimi shush-shushing him, trying to explain in a few words about beauty parlors and hair dye. Since it goes better with the fire-engine red shirts I favor, in recent years I tended to stick with medium brown hair. When too much familial gray was first showing up around the edges, I visited my neighborhood drugstore. My tried and true brand was out. My hair was the most unnatural pink you ever saw. Highlights? Forget highlights, where was the brown? I prayed I didn’t see anyone I knew as I drove back to the store and bought brown with NO red in it, according to the label. I re-colored, re-rinsed, re-dried – and it was still red. Darker red, but still not brown. Now, I was a busy person, work, church, grocery-shopping, bill-paying, errands around town, you know the drill. I had no choice but to go out in public. Some folks were kind enough to say they liked it. A few giggled until they saw the set of my jaw. I let my hair enjoy its redness for a week. This time I bought DARK brown with no red, and this time it did come out brown. Dark brown. Really, really dark brown. Almost black, it was so brown. Oh well, I looked more like my mama. That wasn’t a bad thing, really. 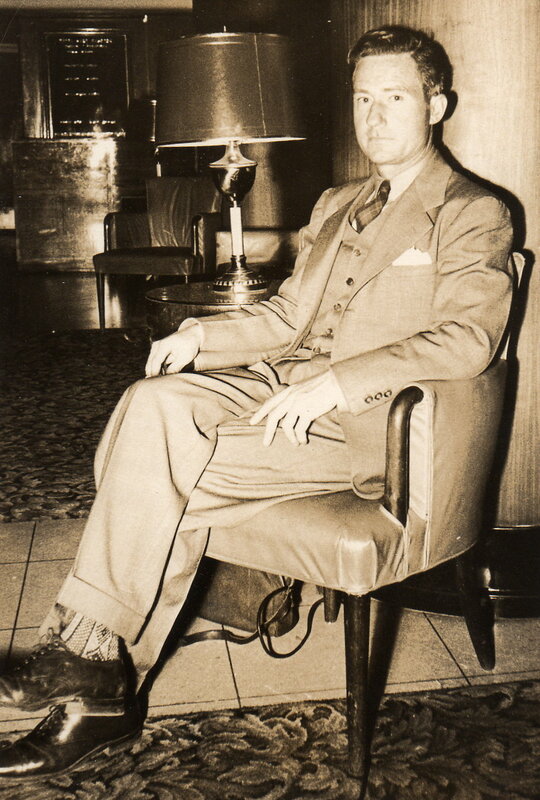 Daddy (Harold Motte, Sr.) enjoying Sunday afternoon visit with friend in the lobby of the Sanborn Hotel. Love those socks! Florence was easy to get around in when I was growing up. We had a variety of transportation modes, car for out-of-town, bicycle for around-town, and feet for in-town. Kids and grownups alike did a lot of walking in those days. Things were closer together then, homes, gas stations, grocery stores, fish markets, churches, parks, schools, theaters, the shopping district, everything. You needed a car if you were going out to the airport, out to Second Loop Road or out to Five Points, but if you went downtown, you walked. Buying something too big to carry, like a sofa or refrigerator? The store would deliver it right to your door. Weekly groceries too. The A&P and Colonial Grocery Stores were both in the 200 block of West Evans with smaller, locally-owned grocery stores sprinkled around. If you weren’t driving a car, the clerk would bag up your purchases and a nice fellow would bring them home for you. Harvey’s Thriftway would even take your order over the telephone and deliver it, if you couldn’t make it in to buy your meat and canned goods. Milk from Coble Dairy was plopped down on our front step every morning bright and early, just like the morning paper. Pickup trucks loaded down with produce fresh from the farm drove throughout our neighborhood, just like the ice-cream man. Mama selected our cabbages and butter beans and tomatoes just a few yards from our own kitchen. Need ice? An old-fashioned ice box occupied a spot in our kitchen for much of my younger years. The mule-drawn ice wagon, later the flatbed ice truck, stopped at our address to haul in whatever we needed for the week. One of my earliest memories is strolling down Pine Street sidewalk, headed to Sunday School at First Baptist Church where Daddy was a member. Daddy walked on the street side in case a car came along and splashed a mud puddle or something and mother on the house side. I usually walked in front of them, skipping along in my white Mary Jane shoes and frilly white socks. They encouraged my brother and me to keep our young feet on the sidewalk and off the neighbors’ lawns, and discouraged us from taking a minor detour to chase a neighborhood cat or squirrel. After Sunday School, we all walked another block to attend the 11:00 o’clock worship service at Central Methodist, where Mother was a member. All that walking naturally worked up an appetite, so after church we walked several more blocks to the Boston Cafe on Dargan Street. 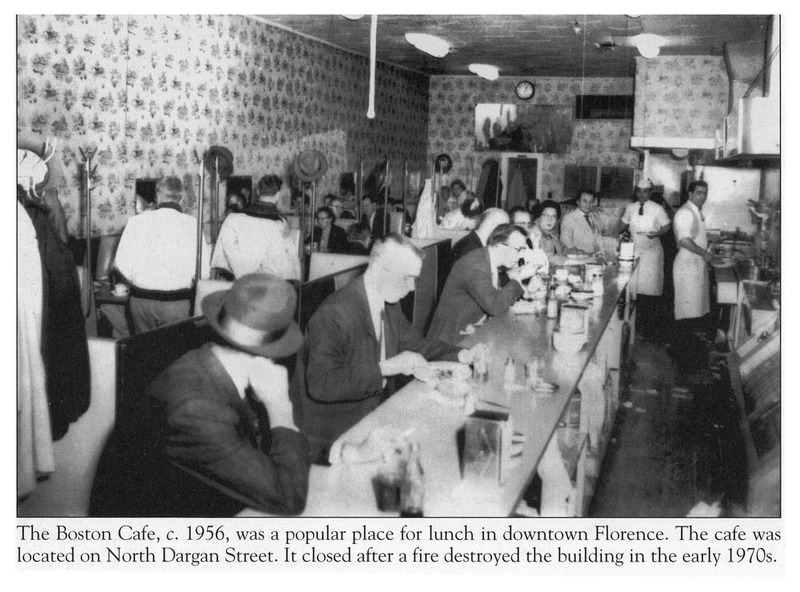 The few restaurants in downtown Florence were really busy on Sundays after church. The Boston was one of our favorites, offering meat loaf and fried chicken and pork chops, butter beans and corn and string beans, dinner rolls, tea or coffee. Dessert might be vanilla pudding, chocolate cake, or lemon meringue pie. We regularly saw a lot of Mama and Daddy’s friends there with their kids in tow and the low-back booths allowed easy conversation between families. If you cleaned your plate before Mama and Daddy were finished, you could go sit with a buddy in his booth and chat. Mother and I continued on, crossing East Evans Street to peruse the showcases in Belk’s before heading up one side of West Evans and down the other. We carefully examined every shop window. Dresses in Gladstone’s, shoes in Miller’s Bootery. Pocketbooks. Jewelry. Hardware. Men’s ties and suits. Window displays changed every week and we needed to keep up with the newest merchandise, just in case we needed to come back and buy something in the near future. By the time we closed the circle back at the Sanborn, Daddy and Harold were ready to call it an afternoon. We might return home by a different route so we could check out somebody else’s lawn, or cat, or squirrel. Families and kids walked other times, too, of course. There was always something entertaining to do, and sometimes getting there was part of the entertainment. In the early 1950’s Easter had several meanings around my house. Jesus’ resurrection was first and foremost. All the other meanings sprang out of that one, like new Easter dresses. We had to have new clothes for Easter, because Easter represents new life, new beginnings, a new start. Yuk. I really, really preferred blue. Since mama preferred not to have crying fits or temper tantrums on her hands, blue it was for my dress, again. Next came the bonnet, of course. Wide brim? Chiffon roses? Fabric or straw? Whatever matched the dress, that’s what we wound up with. 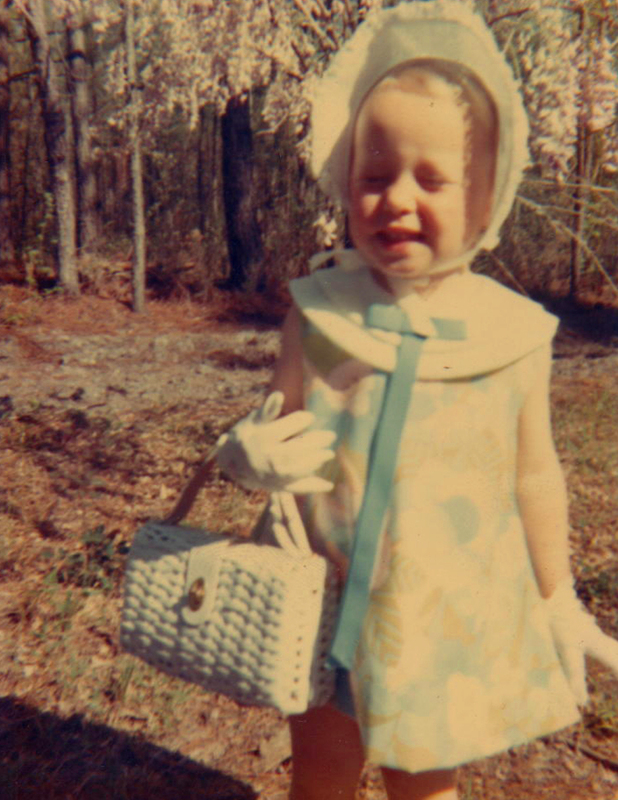 Dress and bonnet in hand, over to the shoe department we marched. That was a neat place. It was such fun to see your foot skeleton in the x-ray machine. “Can I have black this time, please, please?” No, Easter needs white shoes and white frilly socks. Easter eve meant pulling out the vinegar, an assortment of coffee cups and tiny food coloring bottles. Mama boiled a dozen white eggs, then let Harold and me dip them one by one in the smelly dye. I had a blast making mine light blue, and dark blue, and darker blue. Of course I was dipping the same egg over and over. But mama said we needed pinks and yellows and greens too so she put a stop to my experiment. (I was trying to make a black egg but my curiosity was never satisfied in that regard. Pity.) We set aside our masterpieces for the morrow and went to bed early. Easter Sunday Harold and I awoke bright and early to see what the “Easter bunny” brought. We were well aware there was no actual bunny, but here was another meaning that went with Easter: gifts, representing the gift of eternal life in Jesus. Green cellophane grass spilled over the edges of a brand new basket. Nestled atop the grass would be a chocolate egg surrounded with other candy goodies and a small toy or two. The entire basket was encased in yellow or gold cellophane, gathered and tied at the top with a big bow. We usually didn’t get up early enough for the sunrise service at Timrod Park, but 11:00 worship usually featured “Up From The Grave He Arose” and “Christ the Lord is Risen Today.” The sanctuary was filled to capacity and a sea of new ladies’ millinery met your eye in every direction. After church we didn’t go home for lunch. Still in our new finery we headed for Mimi and Da’s house, a sumptuous Easter dinner of ham, fried chicken and potato salad, and another meaning of Easter: family. Being part of a family. Being reunited with family. Our family Egg Hunt with Mimi, Da, aunts, uncles and cousins, included lots of in-laws and sometimes some of their family, totally unrelated to us except on this special day. The kids had to stay inside while the parents hid the eggs outside, naturally. We champed at the bit until finally the signal was given and we made a mad dash with our baskets. 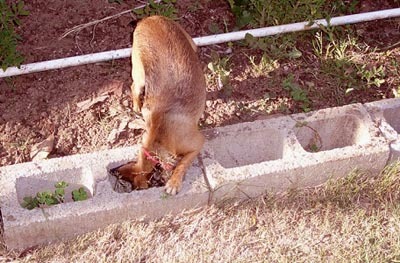 Mimi’s large farm yard was full of likely hiding places. Climbing rose bushes adjoined chinaberry trees. A fenced chicken pen was lined with clumps of jonquils, border grass and assorted weeds. Upturned foot tubs and cracked enamel pots were scattered amidst bits and pieces of farm tools. A rolled-up clothes line lay across a pile of clothes pins. Partially empty chicken feed sacks sat side by side with a stack of dried corn cobs at the edge of the porch. Porch steps! Truck tires! Every imaginable spot was a potential hiding place for a dyed egg. There was an egg count, of course, and a prize egg made of plastic. If you found that one you were awarded something really special, perhaps a chocolate bunny. The race was to see how many eggs we could find before time was called, and how many eggs granddaddy’s hound dog could find. He wasn’t supposed to take part in the hunt but somehow he had developed a taste for boiled eggs, shell and all. If we did our job well he would be disappointed. If not — oh well, the lost eggs wouldn’t go to waste. While us kids compared our basket totals, folding chairs were set up outside. Cups of fresh perked Maxwell House were handed around with wedges of Mimi’s pound cake for the grown-ups. The kids quenched our thirst with Kool-Aid, and more Easter eggs accompanied by salt and pepper shakers were distributed to anyone interested in actually eating them. Many were. Even granddaddy’s hound dog had a good time on Easter! And the smell of vinegar brings it all back. The other day I caught a glimpse of a flowered, overstuffed chair on a TV sitcom and my mind flashed back more than 50 years, to my grandparents’ living room. Clear as day, I saw again Mimi’s flowered, overstuffed armchair, backed against the wall between her living room and dining room. In my mind’s eye I saw the swinging french-style doors separating the two rooms and heard the little squeak one made when pushed. On the living room side the doors were faced with sheer, not quite see-through nylon curtains, affixed top and bottom with narrow brass rods. The soles of my feet felt again the cool grit of sand tracked across the linoleum floor. (It was summer time; shoes were optional both in and out of the house.) Shades of pastel blue and green floral patterns on the floor complemented those on the sofa and chairs. Large, light and dark cherry pink blossoms predominated on Mimi’s slip covers, some of them hand-sewn from feed sacks. That’s right — feed sacks. Chicken feed for Mimi’s hens and rooster came in 100 pound sacks made of cotton material, never paper or plastic. None were ever discarded. Pillow cases, aprons, kitchen curtains and furniture covers could be constructed of that material. Mimi owned a sewing machine in later days, but for the feed sacks she just used a large needle and strands of white thread. Her careful stitches never raveled. She didn’t need a pattern, at least I never saw her use one for these creations. If she got tired of a particular pattern, or if the material wore through, well, another sack would be along most any day. In my house, I treasure several such triggers from that country farm house. Like granddaddy’s platform rocker. One of my earliest and fondest memories of my mother’s father (Da to us grandkids) is of him sitting hunched over in his rocking chair in the living room. 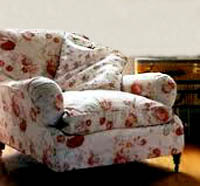 In those days it was covered with heavy faded pink brocade, the pattern worn off on the arms and seat. Da would call us over and suggest, with a twinkle in his eye, that we didn’t really want a slice of his apple, did we? He would proceed to use his pocket knife to slowly pare a large, shiny red apple, taking special care not to break the single spiraling peel. When at long last he was satisfied that all the peel was indeed off, he would not halve or quarter the apple. Instead he carved thin flat ovals, offering one slice at a time to first this child, then that one, then one for himself, until every smidgeon was gone, all the way down to the seeds. Other days he would bend forward a little so one of us could reach the top of his head with his metal pocket comb. His coarse, gray hair cut short in a military-style bristle, we thought it great fun to run the comb back and forth through his hair and watch it spring straight back up. These days it would seem like a peculiar way to have fun, but it certainly amused us kids back then. I don’t remember Da ever rocking in that chair. He sat in it to read mail or a farm magazine, to pull off his boots at night or watch TV in later years, but mostly he reigned over us grandkids from that chair. Today that chair resides in a place of honor in my sunroom, not often used as a chair by me but well used for naps by one of my cats. She doesn’t rock in it either. I never look at that chair without remembering Da, the apple or the twinkle in his eye. Then, there’s Mimi’s pie safe. For newcomers to these parts, a pie safe kept pies (and cakes too) safe — from flies and gnats, mostly. It housed an assortment of other stuff too, like everyday plates, an occasional piece of mail, toothpicks and a few knick-knacks, but its most important contents were Mimi’s home-baked cakes and pies. Coconut pies. Pumpkin pies. Coconut layer cakes or pineapple layer cakes. There was always a pie or cake in that safe, you could count on that. 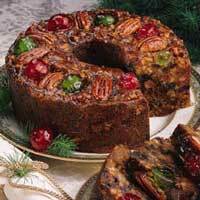 In the bottom section, dark and dry, Mimi would store one of the huge fruitcakes she baked at Thanksgiving, wrapped in rum-soaked cheesecloth and kept “safe” from sweet tooth marauders until Christmas time. That pie safe now safely resides in my house too, not full of pies and cakes but books. Every time I pull one from those shelves, I can almost smell the grated coconut, pumpkin pie spice or rum-wrapped fruitcake. Memory triggers appear in lots of places these days, like the block of ice I saw in a commercial one night. Suddenly it was a summer day in downtown Florence, school was out and all the neighborhood kids were skipping and yelling behind the ice wagon. I smelled again the long-eared mule — or was it a horse? I saw the splintered wood of the wagon bed… fingered coarse wisps of wet straw poking out around the frozen edges… ran my tongue around a mostly-clean sliver of ice… stuck my sandaled toes in the icy water dripping on the steamy pavement… and watched the driver swing his ice tongs, catch a choice block, and lug it over his shoulder to the ice box in our apartment on West Palmetto Street. I tend to wait till my cats run out of food before I go grocery shopping. Of course, by then we’re nearly out of people food too and by the time I get everything checked off my list, my buggy is piled high. Back at home I try to find a way to wedge more stuff into the freezer compartment of my refrigerator. Bags of broccoli, boxes of waffles, shrink-wrapped corn on the cob and trays of hamburger — try as I might they refuse to stack neatly. Oh well, maybe the air can circulate better if things aren’t too orderly. I usually shop in the supermarket closest to home for convenience sake. I don’t have to drive too far, there’s a handy drug store, a gas station on the corner and even a Burger King in case I don’t want to cook some of that stuff I just bought. I don’t have a separate food freezer in my condo, but I think about shopping for one every summer when all the fresh vegetables are on display at the Pee Dee Farmer’s Market. When I was growing up, a farmer with a pickup truck came through our neighborhood every week or so. His truck bed was loaded down with fresh tomatoes and cucumbers, butter beans in the hull or already shelled and bagged up. Wooden baskets were piled high with cabbages, string beans, yellow squash and ears of white or yellow corn, sometimes even peaches or watermelons. It was nice to have such a selection to choose from, right there at our front door. Of course, we lived in town so if the farmer didn’t come by we could run right down to the A & P for what we needed. Listening to Tim’s mom and other folks around town recount stories of their childhood days, I have a fresh appreciation of how easy we have it today. Shopping wasn’t so convenient in the decade or so before I was born, and especially not out in the country. 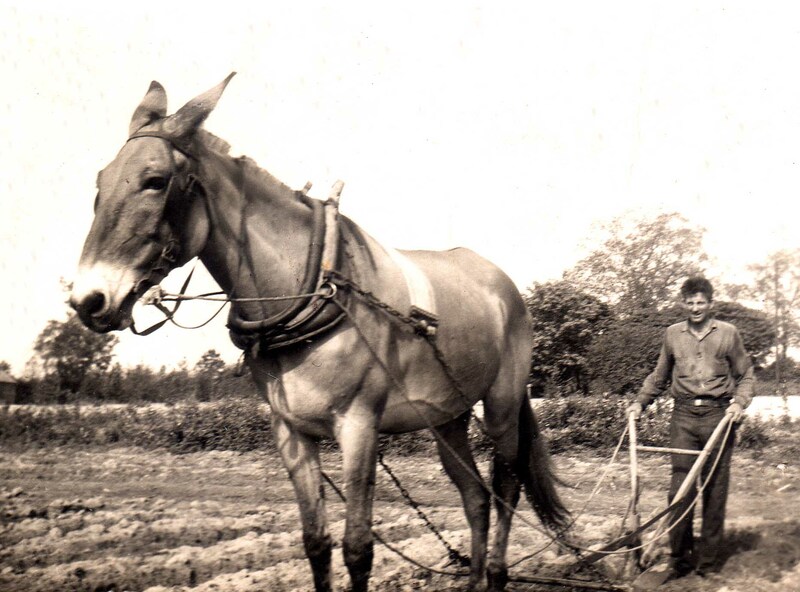 Many farm families had no automobile and some that did couldn’t afford to drive it. The rolling store was a big truck with sides built up and a cover on top. Inside, two rows of tall shelves were loaded with staple goods of every kind, a narrow aisle running down the center just wide enough for one shopper at a time. Cash was short, and not every family had ready spending money to pay for their purchases. So, large crates were attached to the back of the truck to hold live chickens, fresh eggs and newly churned butter, traded to the rolling store for sugar, salt or coffee, maybe dress fabric, smoking tobacco or penny candy. From about 1947 until 1964, D. C. McFadden operated a rolling store in Williamsburg County, a large speaker mounted on top to let folks know he was coming. A former bread truck, his store had a feature many others lacked — a cooler for soft drinks and ice cream. Tim’s dad Theron Cox had helped him install it and rigged up a power cord. He’d leave the cooler plugged in overnight, thus as he made his route during the day the ice cream would stay frozen and the cold drinks would stay cold. It was a popular attraction for all the neighborhood kids to hear Mr. McFadden’s store coming! Most meat and produce were consumed fresh, dried, canned or salted at that time. There wasn’t any other way to keep perishable food. Only large cities had “locker plants,” refrigerated buildings containing rows of individual meat lockers, rented (and locked up) by folks needing a place to store large quantities of meat or vegetables. Many Pee Dee area homes still used ice boxes, and actual refrigerators had small freezer compartments, only big enough for an ice tray or two. After WWII, Theron Cox began putting his refrigeration skills to work. Locker plants began to appear throughout lower South Carolina, and plant owners hired Theron to install the equipment to make them work. Now a family could purchase a side of beef or bring in their own pork and poultry, rent one or more lockers by the month to freeze and store their meat until needed. Families could have fresh-frozen meat and vegetables year round, although they might have to travel many miles to get to their locker. As home deep freezers began to appear, gradually locker plants around the state began to close down. Supermarkets with adjacent locker plants began offering meat cutting services, sausage grinding, hickory smoking or sugar curing for hams in order to maintain their customer base. Jim’s IGA over in Lake City was one of those. These days an ice cream truck comes through our neighborhood in the summer time. The musical melody that announces its presence brings back fond memories of popsicles and moo bars, vanilla ice cream cups and wooden spoons. But I’d love to see a rolling store come by my house, even if I don’t have any live chickens to trade.